Lita and Lonney Mills knew that when they could finally upgrade their kitchen they'd fill it with the tones and sparkle of the Pacific Ocean. The couple had retired to their own couples retreat in Carlsbad, CA right across from Batiquitos Lagoon, and just a mile and a half from the sea, and it was turquoise and beach glass that came to mind. They would turn their most loved, most used room in the home into a sea inspired jewel box. 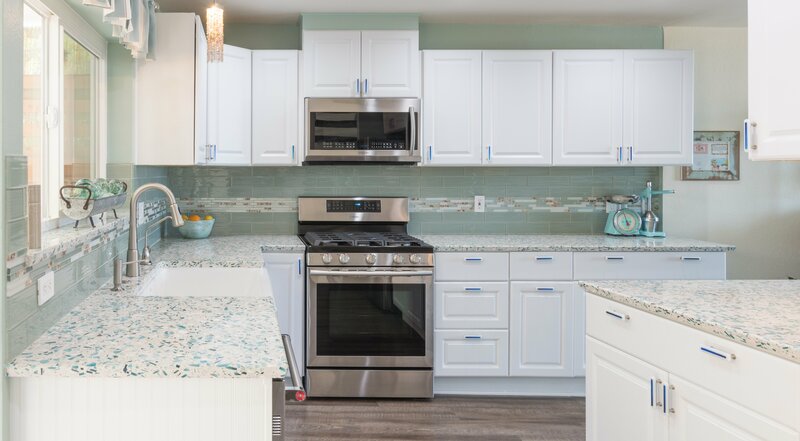 It was the beach glass look of Bretagne Blue - it's blend of fine architectural glass and opalescent oyster shells suspended in a white base - that instantly captivated this coastal loving couple. This was going to be coastal kitchen anchored with Vetrazzo recycled glass countertops. “I just love seeing the sunlight bouncing off of the countertops, and the colors that hit the walls and the backsplash,” said Lita. 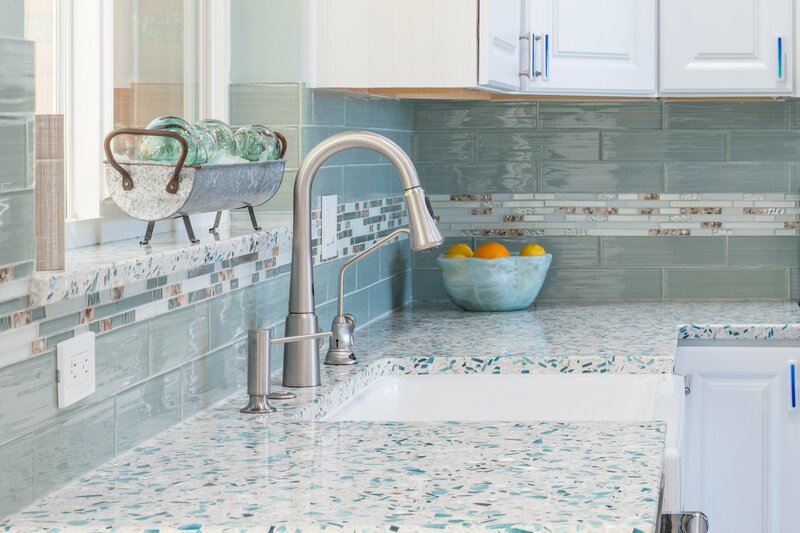 Inspired by how Vetrazzo brings old glass to new life, Lita continued the design theme by incorporating recycled glass bottles, bowls and décor in the kitchen. Recycled glass bowl from Leaping Lotus, a shop in the Design District, Solana Beach, CA. For years, Lita has been designing interiors and exteriors as a side gig and she and Lonney designed the layout of this home, customizing it to be more cottage than condo. They envisioned a bright, beach getaway with all furnishings, artwork and fabrics correlating with the ocean and sea life. And the recycled glass counters were Lita's grounding design element. “The countertops are the artwork of the house,” she said. Above the sink there is a trough with glass balls, which are actually Japanese antique fishing buoys. Lita found them at a shop in the Design District that specializes in unique antiques and newer pieces of recycled art. 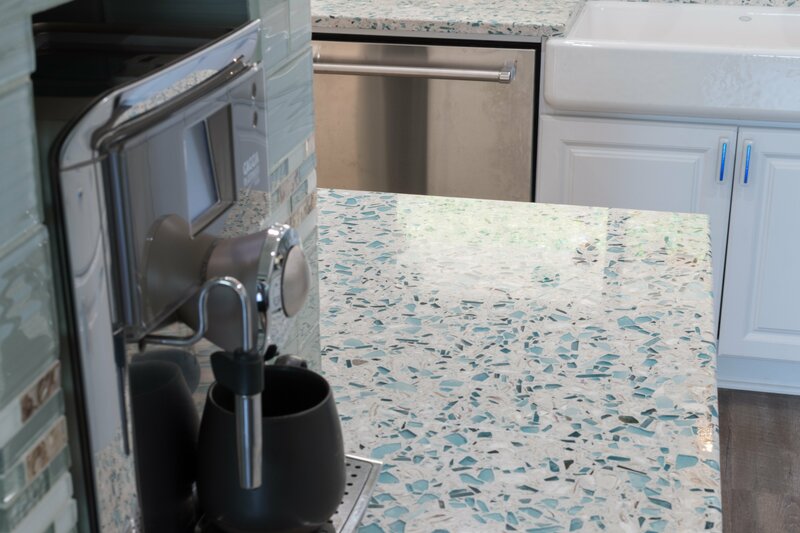 John DiSalvo of Sicilian Marble & Granite Inc., a certified Vetrazzo fabricator, cut and installed the recycled glass surfaces provided by Stoneville USA. Lilliana Bosforo, slab and fabrication manager of Sicilian Marble & Granite, Inc. said it was a combination of Lita's design touches and the luminosity of the Vetrazzo that grabbed her. Lita paired the white cement based countertops with a white KOHLER short apron enameled cast iron sink and a Moen stainless steel faucet. Atop the window sill finished with Vetrazzo are sea foam colored Japanese diving balls. The light above the sink, purchased from a designer lighting store in Encinitas, reminds Lita of a jellyfish. When lit, the little jewels project a rainbow of color in the kitchen. 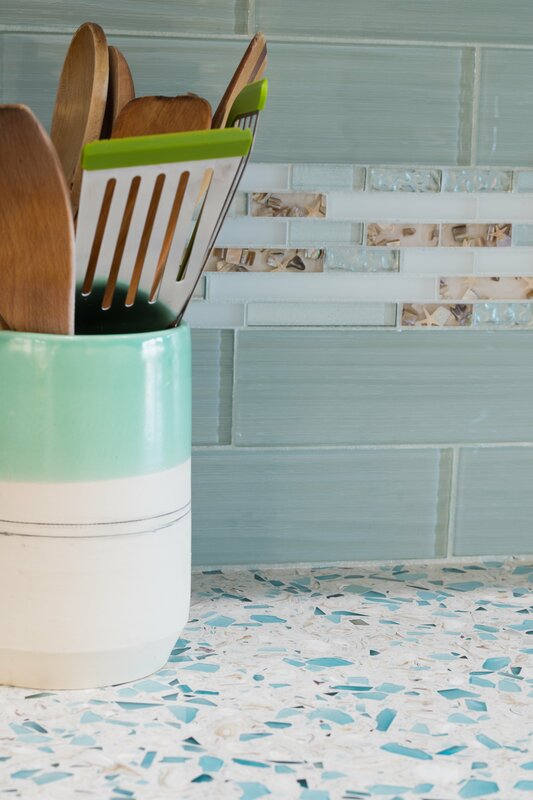 The backsplash tile is a combination of aqua and seafoam green. Instead of a typical glass tile, this one has ripples in it to mimic water. The decorative band in the center of the backsplash tile is made of seashells and starfish, something Lita envisioned and then actually discovered at Stoneville, where she and Lonney sourced the Vetrazzo Bretagne Blue countertops.  Stoneville USA carries a full selection of Vetrazzo colors from bold and bright to soft and subtle. You may notice the countertops are cleared, but that’s not always the case. Both Lita and Lonney are passionate about cooking – and so are their five children. In fact, their daughter is a professional pastry chef and won Food Network’s Cupcake Wars a few years ago. The couple's favorite appliance, their Gaggia Espresso Machine, has its own home in a custom nook with a tile surround, freeing up counter space. The Silverbell Paradigm water proof flooring, purchased from A1 Flooring, resembles weathered driftwood – also a match with Bretagne Blue and the beach cottage look. 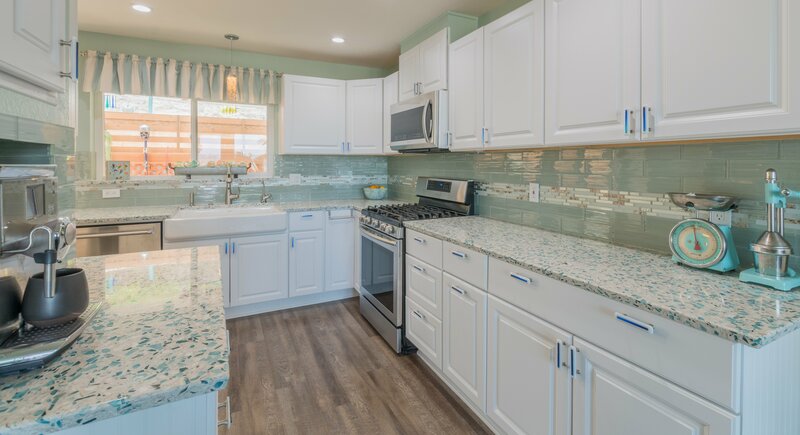 Lita and Lonney’s kitchen is a good example of how homeowners can turn an everyday kitchen space into their dream space by centering their design, and their budget, on premium recycled glass countertops. 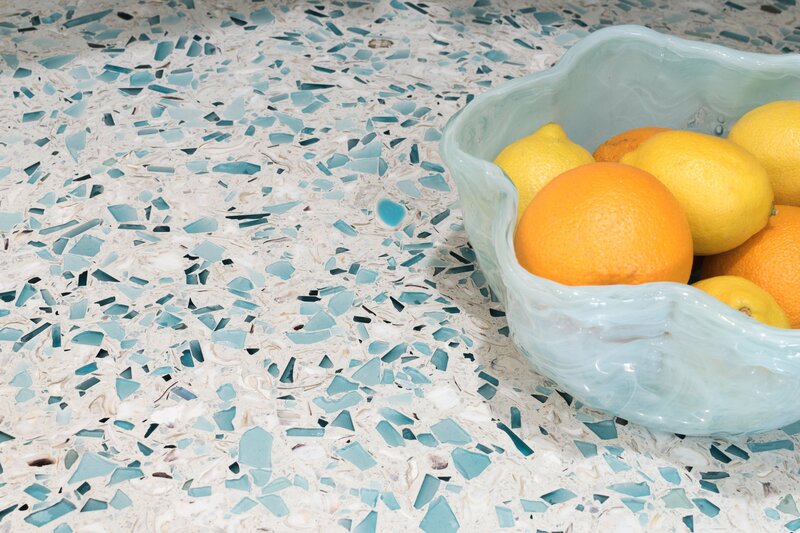 Unlike the lower-end recycled glass surfaces available at big box stores, Vetrazzo’s color mixes have larger pieces of glass which make the slabs dynamic, and unique. Each one is handcrafted at Vetrazzo’s atelier in Georgia. By investing in higher grade materials Lita and Lonney took their condo from cookie cutter to custom beach house. To see more beach homes featuring Bretagne Blue and other coastal colors, download our Endless Summer Inspiration Gallery.